Well, this left me lost for words. I was a fan of Nostalgia Nerd's videos and channel anyway, but the recent retrospective investigation into the Atari Jaguar is mind blowing in its depth and quality of research. He also references my Club Drive article in the video description, so extra brownie points there! In all truth though, while there are many, many videos documenting the Jaguar on YouTube, many of them paint the system in an overly negative light whereas this one is almost completely neutral and recounts a lot of factual information intercut with advertisements, expo footage and clips taken from classic TV shows like Games Master and Bad Influence. Ah, Andy Crane and Violet Berlin...if ever a presenting duo need to be reunited for a brand new series of Bad Influence, it's those two. 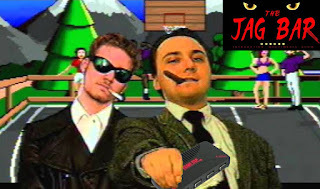 Perhaps the most well-known Jaguar retrospective on YouTube is The Angry Video Game Nerd's take, which is almost completely negative in tone. Hilarious yes...factually accurate? Not so much. 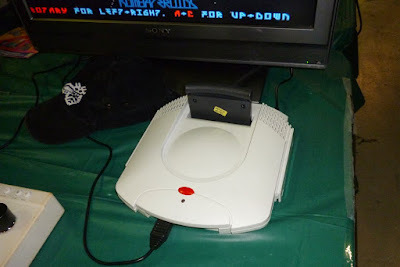 The section that claims the Jaguar CD is prone to breaking down if you so much as look at it has a lot to answer for; with even more people now incorrectly believing the thing is as fragile as a the paper crown from inside a particularly cheap Christmas cracker. Note: it isn't. Mine fell off a shelf and it still worked perfectly. A couple of things I noticed in the video. At the 23 minute mark, some beta footage of Alien Vs Predator shows the player using a double barrelled shotgun (see image below). I personally have never seen this short snippet before and didn't know this particular weapon was ever in any build of the game...proof that you learn something every day! Secondly, when he's discussing the Jaguar controller (11:20), it looks like the one he's using has had the wire cut off. Very bizarre...but thought it was worth mentioning for no reason in particular! 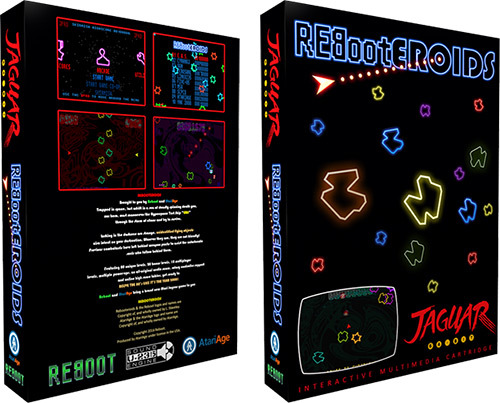 Pretty sure I played a version of Rebooteroids back in 2013 at the very first Play Expo Manchester I attended. You know, the one where I met Jeff minter for the first time and he hadn't yet taken out an injunction against me. It was on a white Jaguar squirrelled away in the retro gaming freeplay section and I distinctly remember being impressed by the silky smooth gameplay and pyrotechnic nature of the visuals. Thinking back, it was almost like playing Geometry Wars...but not. And on a Jaguar. Was there a rotary controller too? My mind has been clouded by the subsequent years of alcohol abuse, but from what I remember it was quite good fun. in fact, below you'll find an image I've stolen from my own article from that very event. Wow...2013. Time flies, eh? Five gameplay modes (see below)! Share your high scores online with QR code! Features original music by 505 and MSG / reservoir gods. Arcade: The standard Rebooteroids game, featuring 100 pre-designed levels for you to fight through. Co-op: As above, but Player 1 will control the movement of your ship, while Player 2 controls the shooting via a rotating gun turret fitted atop the ship. Skirmish: Random levels of ever-increasing difficulty. 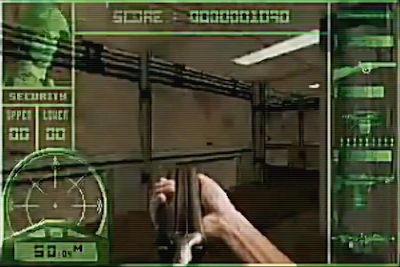 Skirmish co-op: As above, but with Player 1 controlling the movement, while Player 2 controls the shooting. Kombateroids: A multi-player head-to-head battleground. As stated, Rebooteroids is available to preorder over at Atari Age and costs $80 for a regular black cart version and $85 for a clear case version. It comes fully boxed with a colour printed manual too and looks like a really cool addition to the Jaguar's growing library. 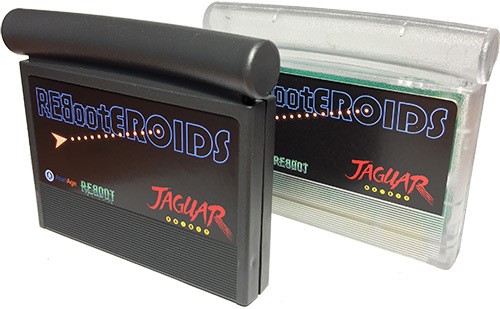 I won't lie it's a bit of of my price range but from the comments on the forum plenty of Jaguar fans have snapped copies of Rebooteroids up. 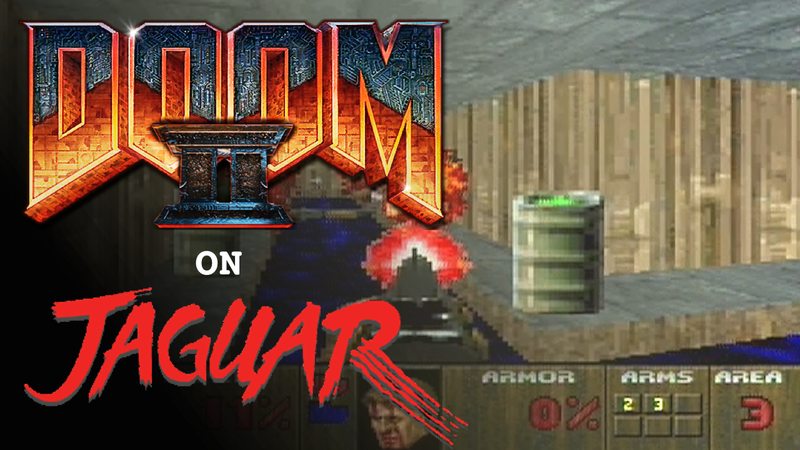 DOOM II never came to the Jaguar, which - as stated in the video below - is a bit of a surprise when you think about it. 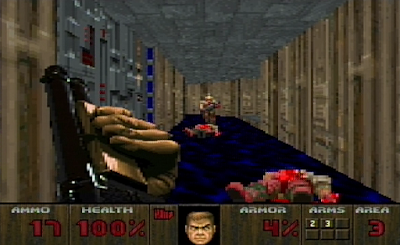 DOOM is easily one of the most celebrated games for Atari's final system and DOOM II would undoubtedly have sold tonnes if it had been released for the platform. 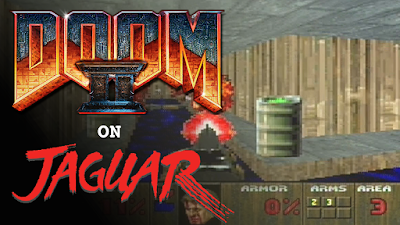 Happily, a fan project did bring DOOM II to the Jag in a fashion - a couple of different ROM hacks (called V98 and AC2011) were posted online by fans a couple of years back and now I've had the opportunity to sample V98 for myself. 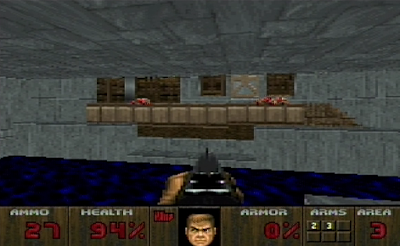 According to this thread at Atari Age, the differences between these two variants is limited to the levels contained in each, and there is no 'complete' version of DOOM II for the Jaguar that contains all of the levels from the PC game. This is disappointing but with hindsight, the Jag does chug somewhat when dealing with some of the levels contained in the version I have...so I dread to think how slow it could potentially get with some of the really adventurous and sprawling later levels thrown into the mix. The screens in the video of the 'other' version of DOOM II are actually from the Dreamcast home-brew port, but that is basically the CC version...but you get the idea! 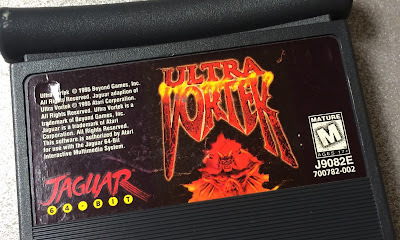 After not buying any new Jaguar stuff for months, last week I spotted a fairly cheap Ultra Vortek cart on eBay and snapped it up. It was only £20 and Ultra Vortek is not a particularly common title for the Jag so it was a no brainer really. I knew that it was a 2D fighter in the same vein as Mortal Kombat and had heard that it was one of the better games for the system. Below you'll find a short 'first look' I made when I fired the cart up for the first time. This is quite cool - it's a UK-specific preview booklet for the Jaguar. How do I know it's UK-specific? Because I'm a genius, that's how. I also have eyes, and I can see the £ signs on the pages, and the back cover lists all of the UK locations that a Jaguar could be purchased. Furthermore, I'm from the UK and in 1997 I bought a Jaguar controller from one of the stores listed. It was the Silica store in Debenhams' Manchester branch, in case you wondered - incidentally the same place I got my first Dreamcast in November 1999, fact fans. Anyhow, thanks to Nathan from Every Bit Gaming for this booklet. There are some notable inclusions here, as page 6 features World Tour Racing when it was still known simply as 'F1-Racer,' and there's a preview of Mortal Kombat 3. I'm pretty sure that image isn't from a Jaguar build...but who knows (it isn't). On page 4 you'll also find an interesting 'upcoming games' list with some intriguing entries: Gotcha!, Starlight Bowl A-Rama, and Highlander 3 chief amongst them. Scans of every one of the 8 pages are below and feel free to copy them for your own ends if you like, I literally don't care. Click the little camera icon in the bottom left of the gallery and choose 'direct image link' for full screen images that can be saved. Guest Article: Why Did The Jaguar Fail? Made possible by Tom and Jerry. Theme images by Ollustrator. Powered by Blogger.